The Ferry Building in San Francisco is a historic landmark that once served as a transportation hub but has now morphed into a marketplace full of cafes and restaurants. It sits along the Embarcadero at the foot of Market Street and you will find many of the historic trolley cars making stops in the front. One evening I took the short stroll from my hotel over to this place, in hopes of getting a shot or two. I was happy to find it deserted inside, so of course I got a few shots there, but I was more happy when I wandered outside and located an adjacent pier that offered this wonderful view of the structure. 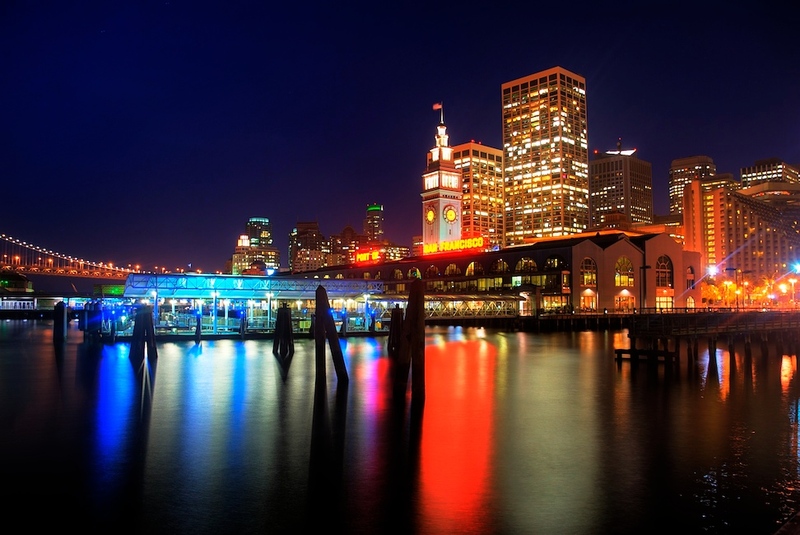 Once I saw those neon lights on top that spell out "Port of San Francisco" I knew I was in photography heaven. I rather like nighttime photography, though I don't often have time to pursue it, so I was pretty fired up to get some architecture, skyline, water, HDR, darkness and all those twinkly lights and reflections in one fell swoop. This is a 5 exposure HDR shot at f/7.1, with exposures from -2 to +2. The longest exposure went 30 seconds, which feels like an eternity when you are excited about seeing what you came up with. I merged them in Photomatix, then made some adjustments in PSE and Aperture.